While ground squirrels are probably one of the more common rodents in the Santa Barbara County area, their adorable looks can come with a heavy price in terms of damage to your home and property. 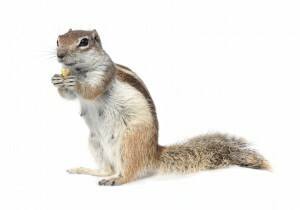 You don’t have to let squirrels run rampant, take your property back with the help of So-Cal Pest Control! One proven method of squirrel removal is setting animal traps on your property. This is a very humane way to trap nuisance squirrels! This method can reap big rewards by allowing the squirrels to become accustomed to the presence of the trapping device days ahead of when we set the trap to operate. What once was a pretty nice squirrel hangout becomes their permanent home. When live animal trapping is not the most effective or only solution, squirrel baiting involves setting up bait stations in the areas of your property that are frequently traveled by squirrels. These stations are tamper-proof containers that allow squirrels to feed on the rodenticide freely. These bait stations ensure that your household pets and non-targeted animals are protected. Give us a call today if your squirrel problem is driving you nuts!